Ask Bender: How do I report my US-listed Vanguard ETFs on Form T1135? With the 2014 tax deadline looming, this is becoming a very common question from DIY investors. Although there are still a number of uncertainties with regards to filling out the form, an investor with a relatively straight-forward situation should be able to muddle along for now. 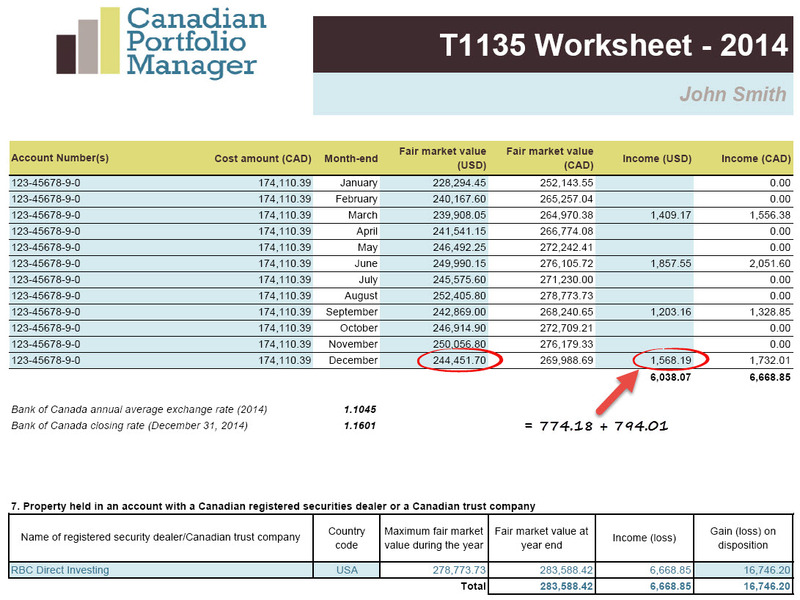 If your US-listed Vanguard ETFs had a total cost base of at least $100,000 in Canadian dollars at any time during the 2014 tax year (and you held the ETFs in a taxable account), you need to file Form T1135. Please do not rely on the cost base that your brokerage provides you with (for more information on the errors that your brokerage may be making, please read my recent post, Book Value Blunders). If you need more information on how to track the cost base of your US-listed ETFS in Canadian dollars, please refer to Calculating Adjusted Cost Base when Purchasing Foreign Currency Securities, at Adjusted Cost Base.ca. Once you have determined that you are required to file Form T1135, you will also need to calculate any gains and losses realized on the sale of your US-listed ETFs during the 2014 tax year. Regardless of whether you have to file Form T1135, you still need to report these amounts, so hopefully you have been keeping accurate records. If this is not the case, please refer to our white paper, As Easy as ACB. In the paper, we recommend using the free online resource, Adjusted Cost Base.ca, in order to keep track of your gains and losses for tax purposes. By clicking on the link below, you will be able to download the T1135 Worksheet for 2014. Any areas in light blue can be filled in by you (all other cells have been protected and should not be tampered with). Using your month-end brokerage statements, tally up the market value of your US-listed ETFs in US dollars. In the example below, the investor held two US-listed ETFs with a total market value in US dollars of $244,451.70. Enter these amounts into the Fair market value (USD) column. Note: If your brokerage statements display the market value of your US-listed ETFs in Canadian dollars, do not use the provided spreadsheet; it is meant to convert US dollar market values into Canadian dollars using the average Bank of Canada exchange rate for the year. If you only receive quarterly statements, this can cause issues with obtaining the missing month-end values of your US-listed ETFs. The Investment Industry Association of Canada has asked CRA to address what an investor should do in this situation – so far there does not appear to be an answer. To be conservative, the investor may decide to estimate the fair market value by multiplying the number of shares held at month-end by the closing market price per share of the security at month-end (which is available on Vanguard’s website). In the example below, the total fair market value in US dollars for the May 2014 month-end is estimated to be $246,492.25. Using your monthly brokerage statements, look for any dividends received during the month (for Vanguard equity ETFs, these are generally paid quarterly). The dividends should be the gross amount (i.e. before foreign withholding taxes). Enter these amounts into the Income (USD) column. Is there a new spreadsheet available for the 2016 tax year or can I use the one for 2014? any progress on the FWT paper update? XEF has now a bid/ask spread of 0.55% (14cts), VIU has similar spread too. Is that normal for international equities? Is it ok to buy them with that spread? @Julio – the bid/ask spread can change throughout the day (for example, XEF is currently showing a 2 cent spread, and VIU is showing a 4 cent spread). If the spread is extremely large, you could always wait for another day to trade (but there may be an opportunity cost to do so). I noticed you have different model portfolios. One includes several DFA ETFs. This kind of deviates from the couch potato models. What’s the purpose of these ETFs? Core/satellite models? @Julio – the DFA funds are only available through approved advisors (they tilt towards small cap, value and profitable companies, but do not employ active stock picking strategies). For DIY investors, the ETF model portfolios are more relevant. Have you been able to update your white paper on withholding taxes using the new MERs? @Julio – I’m waiting for the latest year-end annual reports to be released from the product providers (this usually occurs sometime in March). I’ll try to update the FWT white paper after the release. Justin, this is really a question for an accountant, but if a corporation has a non calendar year end, say July, would you use the average annual exchange rate for the previous year, being the most recent full year the BOC has published a figure, or something else entirely? For example, if you were calculating the average annual exchange rate between August 1, 2014 and July 31, 2015, you would start by taking the average monthly exchange rate for August 2014 and multiplying it by its weight during your tax year – in this example, it would be [1.09272500 x (20 days / 250 days) = 0.08741800]. You would do this for each month and then add them all together. I would calculate an average annual exchange rate using this example of 1.19244840. Please speak to your accountant though to see what they would recommend doing. I’ve also heard that the T1135 does not apply for assets held in a professional corporation … Could you confirm that? I believe that such assets are also US estate tax upon death as the holding company continues…. Very well done Justin, very well done. I have one question. When establishing the FMV of an account, do you include the cash component or just the equity portion? @Constantine – great question. For US dollar accounts held with a registered Canadian securities dealer, just include the total FMV of the ETFs (not the US dollar cash sitting in the account). although the money is invested in foreign countries? @YIBING – you are correct. Your holdings in VXC and VDU would not have to be disclosed on Form T1135, as they are Canadian-domiciled entities. There is an interesting quirk in the foreign currency conversion guidance provided by CRA for T1135: The maximum FMV during the year should be converted using the average exchange rate for the year, while the FMV at year end should be converted using the exchange rate at the end of the year. In 2014 this leads to the interesting effect (at least for my portfolio) that the YE FMV is higher than the maximum FMV because of the difference between the average and the YE exchange rates. @Holger – I thought that was an interesting quirk as well. The worksheet accounts for this difference in exchange rates used, so hopefully the output will satisfy CRA. Thanks for the post, and I hope you don’t mind if I ask a different question. When a Canadian ETF distributes foreign income, such as XEF, how does one identify the source of the income for purposes of claiming the foreign tax credit? (Form T2209 requires that income be split up by country, but ETF providers don’t provide any kind of useful breakdown identifying origin.) Is simply picking the USA “good enough”? @Tyler – great question – although it might have to be answered in a separate blog post. I’ll look into it and hopefully put together a post over the next couple of months. Great, that would be much appreciated. Thanks! Hello again Justin — there is no need for tax expertise as this is strictly a reporting requirement and is independent of tax preparation. This model follows a similar procedure to FBAR reporting to IRS for US citizens or current green card holders in Canada or outside of the US. The parallel between the initiatives by the IRS and our starting to enforce reporting of assets by Canadians outside of the country may not be coincidental. Thank you Justin — as always the devil is in the details. Keep up the great stuff Justin. If all you have to report is US holdings then you can use the US$ as the functional currency on the top of the form. @Chet – I’m not a tax expert, but from what I understand, the functional currency election at the top of the form is only available for certain corporations (if you open the fillable Form T1135 on CRA’s site and try to use this option, it will give you a similar warning). @Amie – good point – I’ve updated the post. Good info, Justin. Works for me!